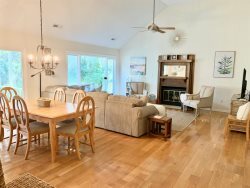 Recently renovated Atrium Villa.The Atrium Villas are the prime rental property on Seabrook Island. It is across from the ocean and the Beach Club and has both views of the ocean and the golf course. Property Size 1,134 sq. ft.